But since eccentric leader Yahyeh Jammeh was forced to step down last year after losing an election, new Gambian president Adama Barrow has made a point of reversing his predecessor's more controversial policies. This has included undoing the country's 2015 name change, canceling its withdrawal from the International Criminal Court, and now rejoining the Commonwealth. The Gambia's readmission into the Commonwealth took effect on February 8, 2018, after its application was approved unanimously by the leaders of the other member countries. The move to re-apply had likewise been approved unanimously by the country's own National Assembly. Sometimes called the "British Commonwealth", the Commonwealth of Nations is mainly a forum for cooperation between countries that were once parts of the British Empire (though it has also admitted other countries in the past). But any association it has with British colonialism is mostly symbolic - Queen Elizabeth II is the formal "Head of the Commonwealth", but within the organization itself, all members are equal and decisions are made by consensus. Learn More: What is the Commonwealth of Nations, and what does it do? Why Did Gambia Rejoin the Commonwealth? In contrast to the country's unceremonious departure in 2013, the Gambia's reasons for rejoining the Commonwealth are pretty clear. In a press release, the Gambian government explained that it feels exclusion from the Commonwealth was a loss for the country, shutting it out from cooperation on things like health and education while denying it the opportunity to punch above its weight on the international stage. The statement specifically mentioned the need for the tiny coastal country to have a voice on climate change issues, and also on how richer countries try to help poorer countries. In a separate interview, Gambia's foreign minister mentioned that membership will also help Gambia build its judicial system, allow it to participate in the Commonwealth Games (a major world sporting event), and make it easier for its citizens to live in other Commonwealth countries. When "Commonwealth citizenship" was stripped from the Gambia in 2015, Gambians living abroad lost the right to vote in the UK and some other Commonwealth countries, among many other privileges. The Commonwealth of Nations now has 53 members, making up about a quarter of all the world's countries. The number today is the same as after the Gambia first left, since the Gambia's readmission is offset by the Maldives quitting the group in 2016. Participation in the Commonwealth is completely voluntary, and any member country can leave or reapply at will. With the Gambia back in, there are now just three ex-Commonwealth countries in the world: Ireland left when it broke ties with the UK in 1949, and Zimbabwe exited in 2003 after a year of suspension over democracy issues. It's a common misconception that all the Commonwealth countries recognize the queen of England as their monarch. The countries that do share Queen Elizabeth II are called the "Commonwealth Realms", but most Commonwealth countries don't have a king or queen at all, and a few have their own separate monarchs. Elizabeth II's current position as Head of the Commonwealth is separate from her role as the queen of the Realms, gives her no authority over member countries, and won't be automatically inherited by her successor. Interested in the Commonwealth? You can always find the latest map and related articles on our Commonwealth of Nations page. 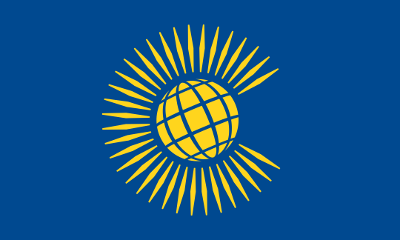 Low-resolution graphic of the Commonwealth flag is displayed under fair use principles (source). Flag of the Gambia is in the public domain (source).